At one time, most towns of any size had somewhere a small foundry that would undertake small casting jobs, often more out of interest and good neighbourliness than for commercial gain. Regrettably, those days are no more and the model engineer in many areas must either adapt commercially available castings or send away to a specialist foundry that will undertake small jobs, often at some expense and with some delay. The alternative is to make your own patterns and castings, which is in fact much easier than you may think. 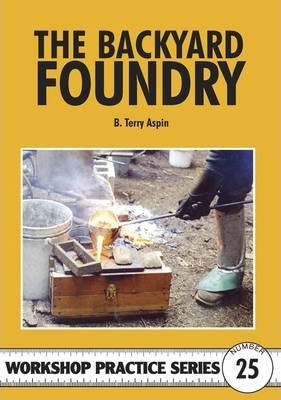 The Backyard Foundry covers basic principles, materials and techniques, pattern making, moulding boxes, cores and core-boxes, electric, gas and coke furnaces, and includes step-by-step procedures with examples of locomotive cylinders and wheels. Sources of specialised materials and even the design of an outdoor furnace suitable for small-scale commercial work are given. Each stage and subject is covered in detail so that even the inexperienced can undertake casting with confidence. Although the book is written primarily for the model engineer, anyone wishing to make mouldings or castings will profit from its pages. Patterns. Plate Patterns. Cores, Core Boxes and Core Making. Casting Locomotive Cylinders. Wheels. Metal, the Furnace and Melting. Solid Fuel Furnace. Suppliers of Foundry Materials.